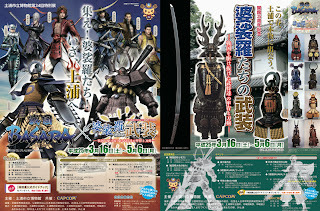 I previously posted some information about the "Basara-tachi No Busou -The armor and swords of the warlords who ran through the Warring States-" exhibition which is going to be held in the Tsuchiura City Museum in Ibaraki between 16th March and 6th May 2013. Today, Capcom revealed more details about the event along with the official guidebook cover (below). As announced in the first post, the guidebook is only available for the exhibition's first 10,000 visitors. My earlier post already described the event's main attractions but the official website has some additional hints. The characters which will be featured include Tokugawa Ieyasu, Date Masamune, Sanada Yukimura, Ishida Mitsunari, Katakura Kojuurou, Uesugi Kenshin, Honda Tadakatsu, Tachibana Muneshige, Kuroda Kanbee, Satake Yoshishige, Ootomo Sourin, Oda Nobunaga, Shimazu Yoshihiro, Maeda Toshiie, Kobayakawa Hideaki and Takeda Shingen. 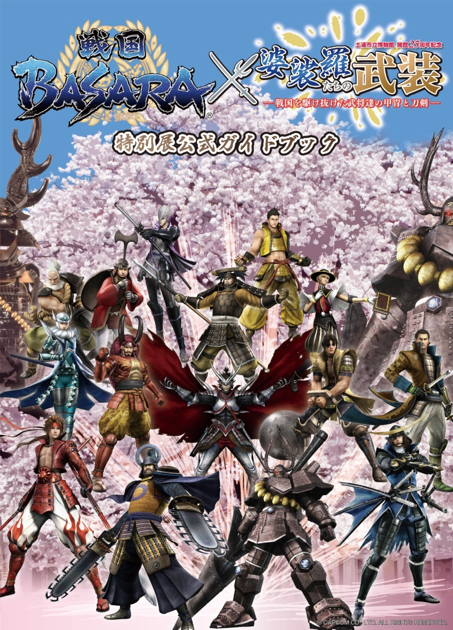 Some other famous figures are mentioned in the promotional material: Uesugi Kagekatsu, Sanada Masayuki, Arima Tadayori and Matsudaira Nobukazu. Even though they haven't ever appeared in Sengoku Basara as warlords in their own right, their armour will be represented in the exhibition. I'd like to ignore the museum's disclaimers and imagine this is some kind of elaborate hint at future developments for the series, however it's much more likely that the museum just included as many appropriately flashy sets of armour as they could. The exhibition is inspired by Sengoku Basara, not dominated by it. The website also mentions two special lectures as part of the festivities. The first will be given by Ogasawara Nobuo of the Tokyo National Museum on Saturday 6th April, on the topic of the meitou (named swords) used by Sengoku-era warlords. The other will be about the enduring appeal of the daimyou of the Sengoku period and will take place on Sunday 28th April courtesy of lecturer Sudou Shigeki from Shikoku University. These talks should be interesting for fans with a general interest in feudal history, and while no reservation will be required only the first seventy attendees will be admitted. Demonstrations which allow people to dress up in replica armour will take place at the museum on weekends and holidays from 10:00 until 16:00. On the afternoons of Saturday 23rd March and Saturday 27th April there will be a special introduction to the exhibition. In addition, visitors can see experts appraising Japanese swords and then try them out for themselves on the afternoon of Saturday 27th April. 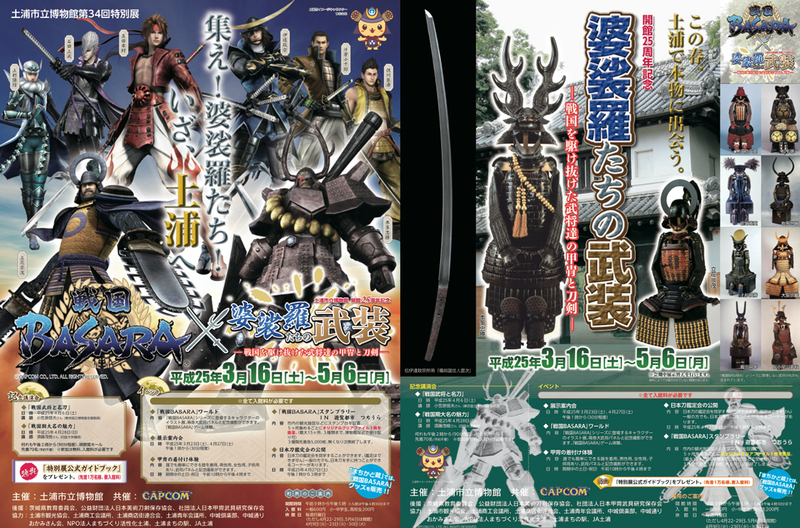 There are some pamphlets which can be downloaded straight from the museum's website with a choice of a Sengoku Basara design or a more traditional historical version. The museum is open between 9:00 and 17:00 (final admission 16:30) every day of the week except Monday. During the holiday period at the end of April these dates will change slightly; it will be open on Monday 22nd April, 29th April and 6th May and close on the 9th April, 23rd April and 30th April instead. Admission costs ¥600 (¥200 for schoolchildren).